Ngoepe made history last month when he ran out for Pittsburgh against the Chicago Cubs, the first African to play Major League Baseball. To do it, he turned a lot of adversity to his advantage. Poor, Ngoepe lived from the age of 2 to 18 with his mother and younger brother — and later his older brother — in a tiny room at the Randburg Mets clubhouse, where mom Maureen worked in the food stall. The room — more of a walk-in closet — was a storage area that was cleared out so Maureen and her boys had somewhere to stay. Somewhere to lay mattresses and squeeze in an old TV. At night, the boys could spread out into a second room where the team’s equipment had been moved to, if they could find space. The young Gift sometimes slept in there, curled up next to the batting cage net. “We took it as a blessing to be with each other in that small little space and make something out of it. Very much love in that room,” Ngoepe said. And just outside, yards away, was the life-changer. The field. “I got to play every day. I got to practice every day,” Ngoepe said. Ngoepe had the hunger and the talent, but there were so many challenges. His MLB debut came at the age of 27, after choosing baseball in a country where few care about the game, after nearly nine years toiling in the minor leagues, and after the death of his greatest inspiration, his mom. 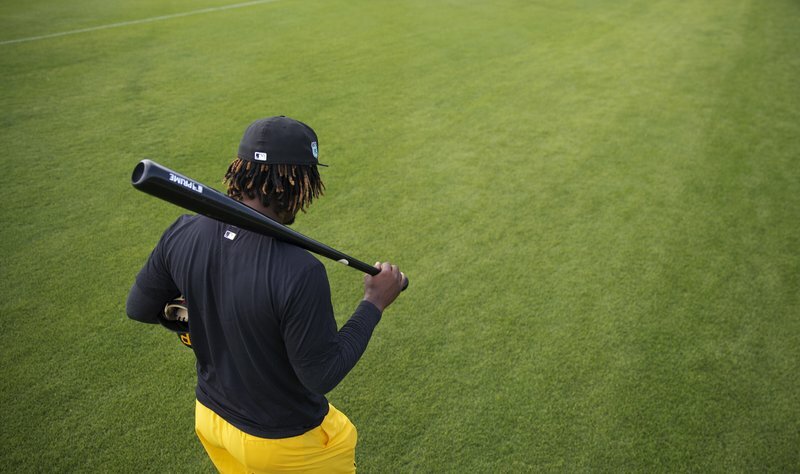 So Ngoepe often played alone, throwing a ball against a wall at the clubhouse and fielding it as it bounced back, honing the ground skills that would make him one of the Pirates’ best defensive players. “The wall was my best friend for quite some time,” Ngoepe said. Later, Ngoepe played for the Mets and was good enough to go to MLB scouting camps in Italy in 2007 and 2008. His mom didn’t have the money but teammates, amateurs like at every ball club in South Africa, gave what they could and got him there. They were also watching in Randburg, where former Mets teammates gathered at the clubhouse and sat up past 3 a.m. to see his debut on TV. With them was Gift’s older brother, Chris, who still lives in that converted storeroom at the clubhouse. On a wall there’s a poster of Gift in a Randburg Mets uniform, kneeling on the first baseball field he knew — the field just outside the door — and clutching a bat. Next to the poster hang three batting helmets. They’re ready to be used for practice when Gift comes home, as he does every year with younger brother Victor, now a Pirates prospect himself and part of their development program. Chris loves it when his brothers come home but, typically South African, he doesn’t care much for baseball. He likes soccer. Associated Press journalist Nqobile Ntshangase in Johannesburg and Associated Press writer Steve Dilbeck in Los Angeles contributed to this report.